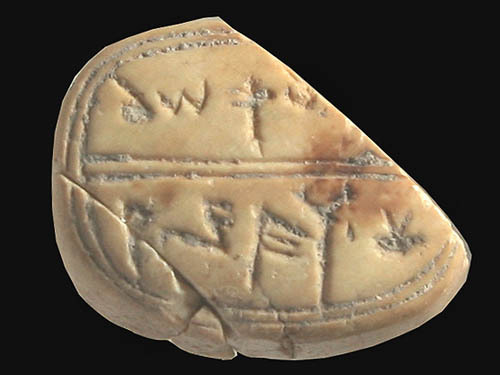 A Hebrew seal dating to the time of the First Temple was displayed yesterday in the City of David in Jerusalem. Hebrew Seal bearing name of "Saul." Photo by Vladimir Naykhin, IAA. This name appears many other times in the Bible. Our minds are immediately drawn to the name of Saul, the first king of Israel. Saul, the son of Kish, lived several decades before the First Temple period. Saul was king of Israel from about 1050-1010 B.C. The temple was built by Solomon about 966 B.C. Do not make the mistake of saying that this is the seal of Saul the king. Seals and bullae (seal impressions) are fairly common. What they reveal is that the names found are the ones we might expect in given time periods, and similar, or sometimes identical, to those names found in the Bible. It appears that the “office” which administered the correspondence and received the goods that were all sealed with bullae continued to exist and operate within a regular format even after a residential dwelling was constructed inside the same “rock-hewn pool” and the soil and the refuse that contained the many aforementioned bullae were trapped beneath its floor. This “office” continued to generate refuse that included bullae, which were opened and broken, as well as seals that were no longer used and were discarded into the heap of rubbish that continued to accumulate in the vicinity. Professor Ronnie Reich is well known for his work in uncovering the Pool of Siloam and the street leading from the Pool to the Temple Mount. The Pool of Siloam is mentioned in John 9. This photo was made at the Pool of Siloam in 2005. 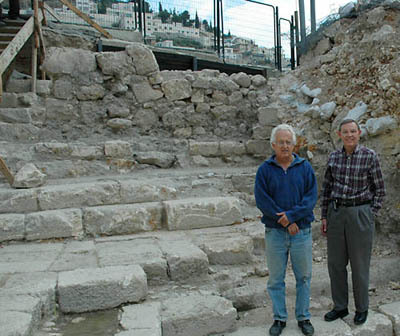 Professor Reich and Ferrell Jenkins at the Pool of Siloam. Photo by Leon Mauldin. This entry was posted in Archaeology, Bible Study, Israel, New Testament, Old Testament. Bookmark the permalink. Gerry, check the comment above. The seal is a NEGATIVE. The impression (a bulla) is POSITIVE. Photo of seal backwards. Hebrew (ancient AND modern) goes from right to left. isn’t the picture of the seal of Saul mirrored?